When it comes to planning your wedding as a Christian couple, there are so many beautiful traditions you can include. There’s nothing like celebrating your marriage with your friends, family, and congregation in a way that honors God’s meaning in your lives. So, we’ve compiled a list of the 10 best, most meaningful Christian traditions for you to incorporate. Forget beach weddings and rustic barns, getting married in your place of worship adds another layer to the meaningfulness of your wedding. Your wedding isn’t simply the union of two people who love each other, it’s a marriage that centers on your faith in God. Getting married in his “house” is a way to honor his importance in your marriage and to show respect. It’s also a place that is likely familiar and important to you; maybe you even met each other through church. Perhaps your groom's home church is extremely important to their family and you decided to host the wedding there. Regardless of which church you get married in, both options honor God and his part in your marriage. In the Bible, Jesus washed his disciples’ feet as a sign of humility and love. Feet were considered dirty and the lowest part of you; to have the Son of God wash your feet was humbling and beautiful. Incorporating this tradition into your wedding is also beautiful. It’s a way to demonstrate that there is no pride in your marriage and that you both put each other above yourselves. You can make this tradition a little fancier by purchasing a wedding basin that ties in your colors or theme. Etsy has some beautiful antique pitcher and basin sets, or you could try your local thrift store. At the reception, or sometimes during the ceremony, it’s a beautiful gesture to allow the guests to pray for you as you enter marriage. In many cases, the pastor will lead a prayer and anyone who feels inclined can rest a hand on you and your husband. As people crowd around you, you can feel all the love and positivity they are putting forth through touch and prayer. For more traditional weddings, there may be a line of guests waiting to bless you with their touch and their prayer. You can also keep it casual and let anyone who feels moved to come place a hand upon you. Regardless of if they get up, anyone in the room can participate in praying for your marriage. This is a common tradition across multiple cultures and religions but is especially favored in Christian wedding celebrations. The parents of the bride and parents of the groom are each given a candle to light. From those two candles, representing each of your sides, you and your groom then light a new candle. This represents the blending of 2 families into 1 through your marriage. It can be a sweet moment to include your parents in a ritual, one they are likely to appreciate and cherish. There are lots of different wedding veil styles and designs you can choose from. Current styles may be fun, but if you’re looking for another way to incorporate Christianity, choosing a traditional veil is best. When you walk down the aisle with your face covered, it represents your individuality and independence. Beneath the veil, it is only you and your relationship with God. When you get to the altar, and you allow your groom to lift your veil, it represents opening yourself up to Him. You are no longer only committed to God, but through Him, you are now committed to your husband and marriage. It’s a beautiful gesture and very symbolic of your faith. This tradition is popular with Orthodox Christian weddings. The couple is led by the pastor or priest around the center wedding table at the front of the church. The pastor is often holding a cross, and the couple wears olive branch crowns. This tradition is heavy in symbolism; the crowns represent the crown of thorns Jesus wore on the cross. It’s an acknowledgment of Jesus dying on the cross so that we can live, and in this case, get married to the one we love. Walking around the table three times is a nod to the Holy Trinity- the Father, the Son, and the Holy Spirit. There is usually a hymn played in the background and sang in unison by your guests and congregation. For your wedding to be legal you will get a civil marriage license. In Christian weddings, there is a tradition of having a second wedding contract that is given by the church. It is a contract you and your groom sign that demonstrates your commitment to God. While it may just look like a fancy piece of paper, it’s truly a way to show that your intention for your marriage is to serve God. Some weddings will include a moment to sit down and sign this contract, as you would with a marriage license. If you plan on having your faith be an important part of your marriage, including this tradition in your wedding could be a wonderful way to show that. This tradition is a nod to an even older, and slightly gruesome, tradition. In Genesis 15:9-10, it discusses how when two groups wanted to join a covenant or agreement together, they would each sacrifice an animal. Those animals would be placed a few feet apart, and the parties would walk towards their animal and meet in the middle. The middle ground between the two sacrificed creatures was considered Holy ground. Then the two parties would join a blood covenant (slicing each of your right hands and shaking them to blend each of your blood together). However, today, some couples will hold each other’s right hands during their vows to symbolically make the space between them holy and in God’s presence. It’s a tradition that represents the seriousness and holiness of creating a marriage. This is a common tradition in religious and non-religious weddings alike. In Christian weddings, rice represents seeds. Seeds are required for growing crops on fertile land, which metaphorically represents growing a family and fruitfulness. Guests will toss rice over the couple as they leave the church to bless them and send them hopes for a fruitful and thriving future together. Some weddings replace the rice with confetti or bubbles, but traditionally rice is used in Christian weddings. You could also use seeds to stay true to the meaning of the tradition. Christianity is a religion that allows so many beautiful and fun traditions into your wedding. Whether you incorporate a couple of them or the whole list, we hope we gave you enough ideas to honor your faith through your wedding. If we left any out, leave us a comment below! 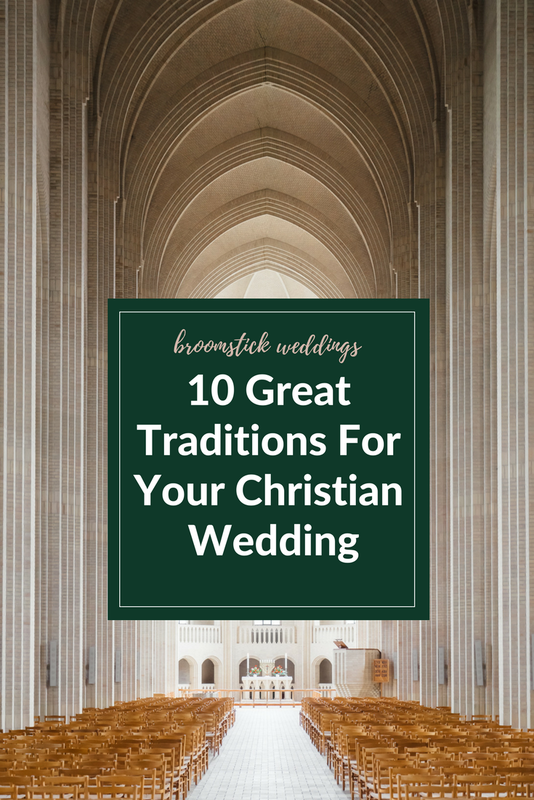 We’d love to hear how you plan using traditions in your Christian wedding. Devon Funk is a writer at Broomstick! She's passionate about travel, learning, and petting dogs. When she's not glued to the keyboard, you can find her volunteering in her community and teaching others about saving money. Be like Devon & Apply to Become a Contributing Writer here.